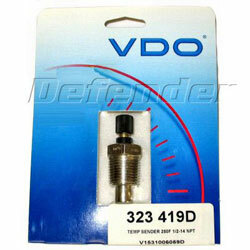 VDO water temperature sender, designed to work with VDO gauges. Senders are matched to gauges according to maximum reading on dial face. Please note: VDO senders have tapered threads and DO NOT require the use of Teflon tape or pipe sealant (This will interfere with grounding causing incorrect instrument readings).